As we approach April, I find that my mind seems to awaken from a foggy Winter slumber. My creative peak, I feel, would be the Summer months. Maybe I have Seasonal Affective Disorder (SAD), or in this case Seasonal Affective Design Disorder (SADD). Or perhaps I’m just a Seasonal Affective Design Disorder Observer (SADDO). Point being, I find that this time of year is also my most reflective. I start to look after myself physically and engage the brain in some sort of extra curricular activity. Sometimes I think diet is a major player in S.A.D / creative block. I’ve always been very keen on diet and what foods are optimal for human beings. Having worked with Daniel Vitalis on his new book illustrations, while also being a regular listener of his podcast, I gradually became aware of the true connection between a proper diet and how the true human (homo sapiens sapiens) are connected. Does it not make sense that we should look at what really is optimal fuel for our vessel? 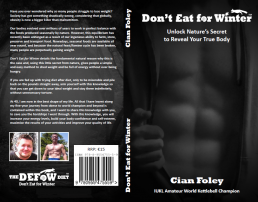 The DEFoW Diet is a type of Paleolithic Prescription. Nowadays, of course, famine is a rarity, so this talent is no longer advantageous. Don’t Eat for Winter suggests that it is autumnal foods, especially foods loaded with carbohydrates, in both starchy and sugary forms, that prepare us for winter by activating instincts and processes within the human body that encourage fat storage. Nature used to moderate carbohydrates for us through the natural seasons, however, now that we’ve taken her out of the equation through modern storage facilities, preservatives, transport etc., we must take responsibility and moderate the consumption of carbohydrates in order to prevent chronic weight gain. Applying this concept to my diet will be the next step. Seeing if my creativity and brain cognition will improve upon applying this lifestyle will be a very interesting aspect for me. You can purchase the book directly here. I’d highly recommend it! This year also marks year two of our founding of fuse:d and its further development. We have some exciting line ups for the rest of the year, focusing on engaging the creative brain through inspirational videos. The new series of evening gatherings are to see, share, discuss and collaborate on all things design. The date is the 27th April, 6.30, Fumbally Exchange, Waterford. All are welcome. I am currently working on a very large installation piece for a private client. The scale is enormous and will consist of a number of bespoke character designs across an exterior wall. The characters will be printed, not hand painted, so it takes any pressure off there. Nevertheless it will be the largest exterior illustration set I’ve ever done. 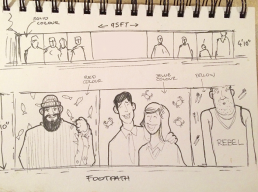 Below is the very fist rough sketch ideas for the project.